I have a 2006 MCS Convertible. When the fuel gage shows 1/4 tank, I run out of gas. I have isolated the issue to the fuel levels not being equalized between the passenger side (fuel filter side) lobe and the driver side (fuel pump side) lobe. I have fully removed the fuel pump and fuel filter housing, replaced the fuel filter, and verified that both fuel level sending units are within specification (19 Ohms low - 298 Ohms full). As I understand, excess fuel from the fuel filter housing is supposed to return to the fuel pump and suction transfer fuel from the passenger side lobe to the driver side lobe to keep both sides at the same level. I have verified this is not working as the driver side lobe is completely empty while the passenger side lobe still has a few inches of fuel. 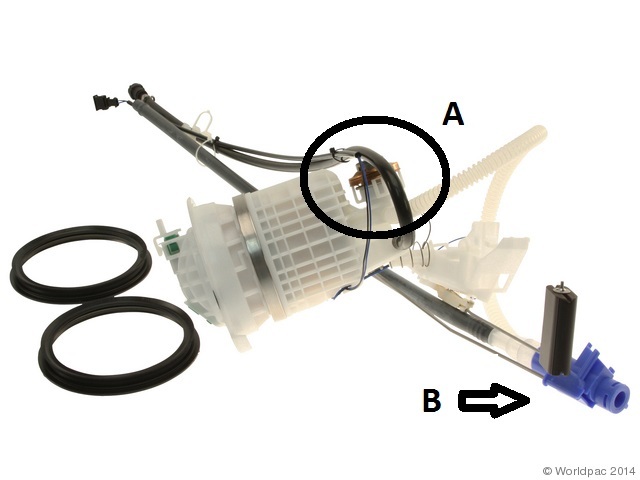 On the fuel filter housing there is what looks like a solenoid "A" with a line going to what looks like a fuel suction pickup "B", and then from there a tube that goes back to the fuel pump. My question, is my lack of fuel transfer an issue of the solenoid thing or the suction thing and can it be repaired or would I need a whole new fuel filter assembly? im having exactly the same issue on my r56, i did even ran out of gas twice, oppended both tank sides, and same issue! The driver's side lobe totally empty (pump dry) but the passenger-filter housing side almost full! 2002 Mini Cooper coolant level sensor location?